Hunter's Moon Remastered by Thalamus Digital Publishing Ltd. 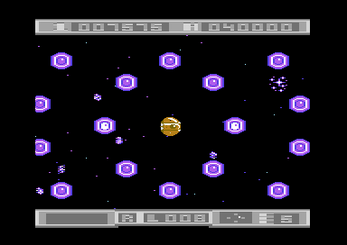 Originally released in 1987, Hunter's Moon is a strategic shoot 'em up set in deep space. Beautifully presented and thoughtfully designed, the game became an instant classic thanks to its measured balance of strategic planning and psychotic blasting. Boasting one of the earliest uses of procedurally-generated content in a computer game, Hunter's Moon pushed the boundaries of the genre and helped redefine what a shoot 'em up could be. 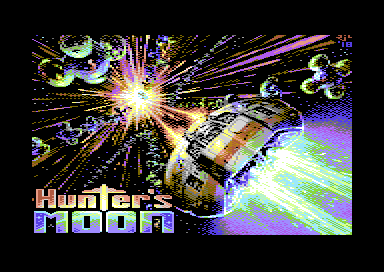 Hunter’s Moon Remastered is a fully remastered, overhauled, and updated version of the seminal C64 shoot ‘em up. 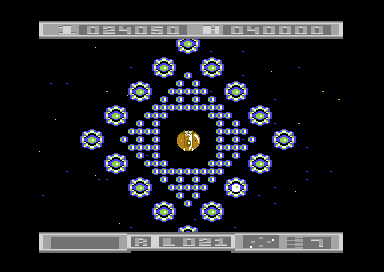 The game has been remastered for C64 cartridge and boasts a host of amazing new features including over 50 new levels, 5 new star systems, new level types, new music, new playing modes, stunning intro and outro sequences, built-in level editor, and enhanced presentation including foreign language support. After flying your trusty ship Hunter too close to a black hole, you find yourself lost in space on the wrong side of the galaxy, surrounded by sprawling, hive-like cities. At the core of each city lie mysterious alien Starcells – these contain valuable navigational data and must be collected to plot a course back home. The aim of each level is to blast through the hive and grab the Starcells, a task made more challenging by the invincible Worker cells which patrol the cities repairing any damage inflicted. These Workers also bring the hive's defenses to life, causing them to spew deadly spores that can only be resisted by using your ship's trusty Perma-Shields. The game features over 180 levels spread across 21 star systems. When all the Starcells on a level have been collected you'll enter the Bonus Game where you can earn a Perma-Shield and an extra life. You must complete every level within each star system to advance to the next; however, should you manage to collect four flashing Starcells you'll automatically jump to the next system. 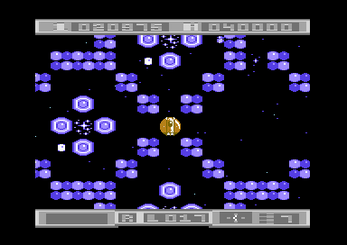 As you progress through the different star systems you'll encounter an array of diverse and challenging hive types, including Attackers that throw out deadly spores, Darkcells which are only visible on radar, Switchers that change direction without warning, Jumpgates which jump to random locations, and Blackouts which plunge the hives into darkness. Do you have the dexterity, precision timing and psychopathic blasting skills to find your way home to Hunter's Moon...? Bonus: Now includes a C64 Mini version of the game! shoot 'em ups ever released for the 64." as good-looking, innovative and as challenging as this." combination of puzzle game and pulsating action." of shoot-'em-ups currently on the market." The downloadable C64 digital version is designed for use with a C64 emulator – it cannot be used with an EasyFlash cartridge, 1541 Ultimate, or Turbo Chameleon. We recommend playing the game using VICE 3.1+, a popular emulator compatible with Windows, Mac, and Linux. Therefore, there are two downloadable versions, one containing the game files, the other containing the game files plus a version of the VICE emulator. Both versions include a simple .BAT file to make running the game much simpler. Please be sure to consult the README file for more information. 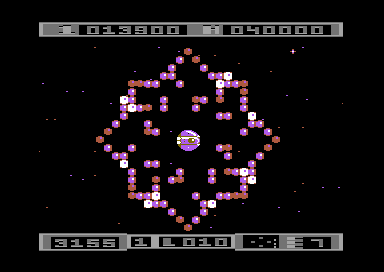 Bonus: The downloads section now includes a special version of the game created especially for the C64 Mini, along with a "CJM" configuration file. 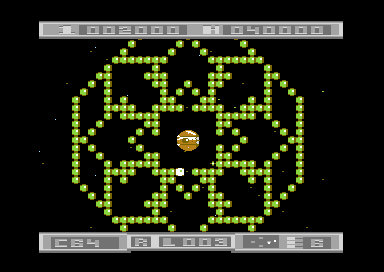 Note that game saving is disabled in the C64 Mini version, both during the game and within the level editor - it is therefore necessary to use the C64 Mini's built-in save functionality to save your game and your level designs. Again, please consult the README file for more information. 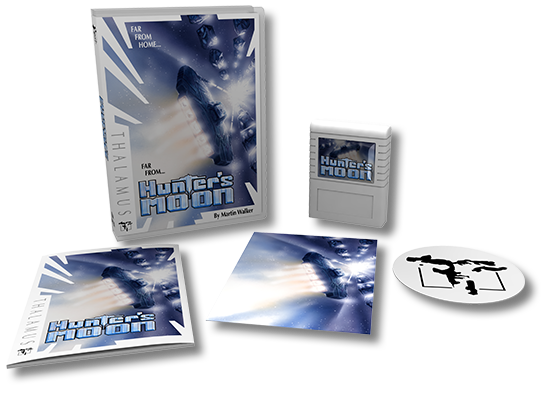 The cartridge version of Hunter's Moon Remastered is now available exclusively from Protovision. The basic includes a cartridge, game manual, cover art postcard, and Thalamus sticker. Author Thalamus Digital Publishing Ltd. I already bought the physical cartridge version off you last year via your Indigogo campaign but would love to be able to play it on my mini too. Is there a means for people like myself to get this without having to buy it again please? The physical versions unfortunately do not include digital versions; you'd need to purchase the digital version to play on the C64 Mini. How do I load the game on a 1541 Ultimate 2+ ? "The downloadable C64 digital version is designed for use with a C64 emulator – it cannot be used with an EasyFlash cartridge, 1541 Ultimate, or Turbo Chameleon." Why is there no .crt file for download? The game was developed for the GMod2 cartridge format and as such there's currently no way to run these files on the Ultimate. You would need to contact the makers of the Ultimate and ask for GMod support. Explains a lot. Let’s hope Gideon’s Logic will add support for it then. Will buy if I can play it on either my U64 / Ultimate 1541 / TC64 / or Easyflash ! In fact I will buy it anyway, provided these formats come as soon as possible ! Due to the fact that the game was made specifically to take advantage of the cartridge hardware, it won't be released in any other formats. Will there be d64 version once you have a cart? I wanted to check it out on a fpga c64. I bought it but Im hoping I can get a d64 version down the road. Unfortunately not - all our releases are GMod2 cartridge images, playable via the Vice emulator. hi how long will it be before protovision will have the cartridge to sell please? The cartridge version is available now from Protovision. Can this game be played on the c64 mini? Unfortunately not - this version is intended for emulators only. That is something I want too ! Plus all the other formats..
You're in luck - a C64 Mini version will be added to the download package this week! Hey , just confirming the cart version will play on a normal breadbin C64? is there anyway we can get this running on a emulator to play on the c64? Our products are designed and developed for C64 cartridge - this is the recommended format for playing the game on a real C64. Thanks for the reply i will buy the cartridge when it gets released as i really want to play on the level designer as its only the basic game on the pc one i have downloaded from yourselves.